Smith & Wesson makes some great looking and great firing guns, we know that. But does the S&W M&P .45 really shoot as good as it looks? A few months back, I did a list of my top seven .45 ACPs on the market, and unfortunately, that list did not include the iconic M&P. I then started thinking about all the praise that the M&P 9mm received for being an excellent home defense handgun and for being an excellent gun for women, and that got me wondering. It does look pretty darn good. …I’m going to take a look at the pros and cons of the S&W M&P .45…in all available flavors…and see just how well it shoots, which models work, and which don’t. I’m going to go into what I like, and perhaps more importantly what I don’t like about each one. Most of the M&P .45 models come with the option of an external safety, except for the Performance Center, which automatically comes with a manual safety. While some handgun owners don’t like the safety on the M&P because they feel it’s useless or can accidentally become engaged when sighting the gun, I personally find it useful when carrying the M&P. It adds an extra level of protection with the gun’s built-in trigger safety. Now that we have an idea about the different types of M&P .45s out there, let’s have a look at those reviews. The standard M&P .45 is one of Smith & Wesson’s most iconic handguns. It’s a polymer frame gun that’s known for its durability, accuracy, and reliability. Unlike its slimmer counterpart, the M&P Shield, this standard M&P is slightly larger and bulky, making it difficult for concealed carry. With that said, one benefit that this gun has over the Shield is a built-in rail for your mounted lasers or lights. 4.5” barrel length and an overall length of 8”. Weighs 29.1 ounces with an empty magazine. One of the things that I like about the M&P is its trigger system. It comes with a pivot-style safety that prevents the gun from being fired unless you depress the lower portion of the trigger when shooting. The M&P is also available with a manual safety that’s easy to switch on and off, adding a layer of protection against negligent discharges. It has a trigger pull of 6.5 pounds, giving a good break without being too sensitive to worry about carrying in a holster. Great accuracy when shooting at targets from 25 yards away. It has 10+1 capacity, which is slightly above average for a .45 ACP. Three backstrap inserts: small, medium, and large. Large trigger guard with enough clearance for gloved hands. The biggest problem with the M&P is its grips. There’s very little traction provided by the grips, making it difficult to hold the gun properly with sweaty or wet hands. This design is one of the few areas of improvement that will always haunt the M&P, but it was corrected with subsequent versions of the gun. The gun’s grips are functional, but nothing to write home about. Another issue that a lot of M&P owners complained about happened when reloading the gun. If you happened to hit the bottom of the magazine too hard when inserting it, you could end up automatically cycling a round into the chamber. While some people may like this, for me, it seems like a huge safety issue. Fortunately, it was fixed with the release of the M2.0. 4.6” barrel length and an overall length of 7.9”. Weighs 27 ounces with an empty magazine (2 ounces less than before). Improved grips that increase traction over the entire handle as opposed to aggressive gripping only on the backstrap with the M&P. It comes with four backstrap inserts: small, medium, medium-large, and large. The slide of the M2.0 is slimmer than the M&P, giving the gun a smaller profile and shaving off two ounces of weight. The grips on the M2.0 were a huge upgrade from the standard M&P. Despite these significant changes, the M2.0’s magazines are backward compatible with the M&P, and vice versa. The primary difference between this and the standard M&P is the comfort. One other cool feature is the built-in metal skeleton underneath the polymer frame which helps make it easier to keep the gun stable when shooting rapidly. The gun had the same overall feel as the first-generation M&P, but its grips were light-years ahead. 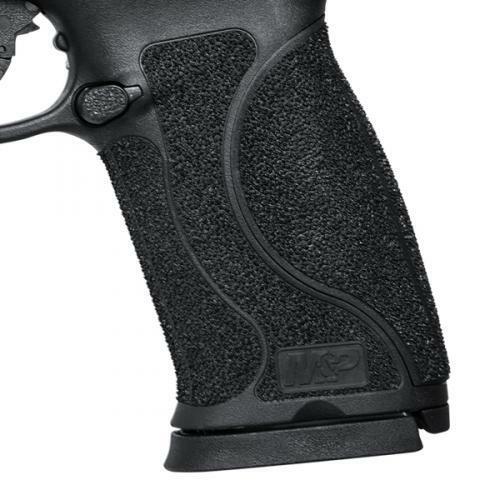 One of the things that I thought that Smith & Wesson could’ve done better with the M&P was its grips, which were too slippery for my preferences. They addressed this issue perfectly by implementing a sandpaper-like grip that provides a lot of traction; combine that with the improved backstrap inserts and you have yourself one comfortable .45 ACP for all hand sizes. The Shield is a slim and lightweight M&P .45 variant designed to capture the concealed carry market. It’s an excellent gun for the person who wants the stopping power of a .45 ACP without having to sacrifice comfort while carrying the gun. One of the features that I really like about the Shield is its extended magazine that holds an extra round while extending the grip. People with larger hands will love this magazine. Overall, the Shield is comfortable to hold and able to accommodate virtually everyone’s hand sizes. 3.3” barrel length and an overall length of 6.5”. Weighs 20.5 ounces with an empty magazine. Comes with two magazines – one regular (6+1) and one extended-grip magazine (7+1). Overall, the Shield sits quite comfortably in most people’s hands. 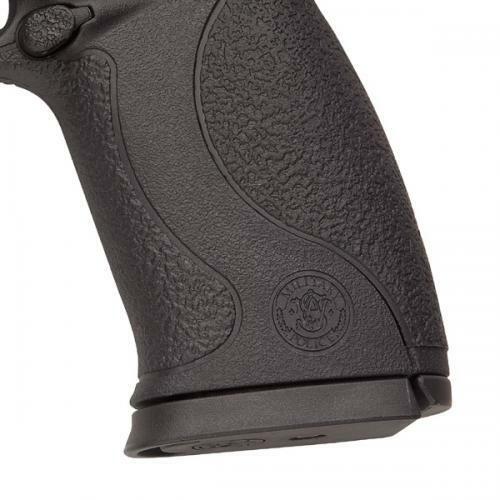 Smith & Wesson gave the texture of the grip much more traction than they did with the Shield 9mm model, making it easier to hold with sweaty or wet hands. The SHEILD’s trigger has a 6-pound pull weight and gives a smooth break. It also has a pivot-style safety that requires the trigger to be squeezed near the bottom in order to fire the gun, adding additional precaution against accidental discharges. Enlarged trigger guard makes it easier to shoot with gloved hands. Deep serrations on the slide make it easier to grasp onto. The metal three-dot sights are durable and easy to use. Incredibly thin – almost as thin as the M&P 9mm. There really isn’t anything to hate about this gun. Its 3.3” barrel may affect accuracy if you’re shooting at a target beyond 20 yards and it also lacks a built-in rail system, but that’s what you come to expect with a compact .45 ACP. The Performance Center Shield is the same as the original .45 Shield, but with a few upgrades. The main difference between the Performance Center Shield and the original Shield is that this gun comes with a ported slide and barrel to help gas escape more efficiently and limit muzzle rise. Same specs as the Shield. Comes with a ported barrel and slide. Improved texturing on the grip for better control. Another really cool feature of the Performance Center M&P is its fiber optic sights. You get two orange rear sights and one green front sight that are all encased in steel frames that protect them from your daily wear-and-tear. Remember, porting has nothing to do with recoil – it only affects muzzle rise. In my opinion, the benefits of having a ported barrel are barely noticeable for the price tag. I find that the sights are the best feature of the Performance Center Shield and, in my opinion, the only reason to spend more money than the original Shield. Not only do the sites look cool, they also make it easier to pick up the gun and quickly line up a target. What’s the Verdict on the M&P? There are minor differences between the different versions of the M&P, but they’re still essentially the same gun. It seems like many of the people who aren’t keen on the M&P don’t like the fact that it’s a polymer-based gun. In my experience, the M&P is just as durable and reliable as any Glock handgun. I also find that the trigger pull on the M&P is smoother than the Glock. Simply put, it’s a well-made handgun that’s incredibly fun to shoot. I am happy with the M&P and think that it’s a great gun for home defense or shooting at the range. Overall, I think that the M&P lives up to its reputation of being a top-notch service pistol. I appreciate its durability and comfort. Like all Smith & Wesson models, the M&P comes with a lifetime warranty and lifetime service policy, which should help inform you on the excellent quality and craftsmanship of the gun. Now that I’ve had a chance to review the M&P .45, I do believe that it should be ranked among the best .45 ACPs. 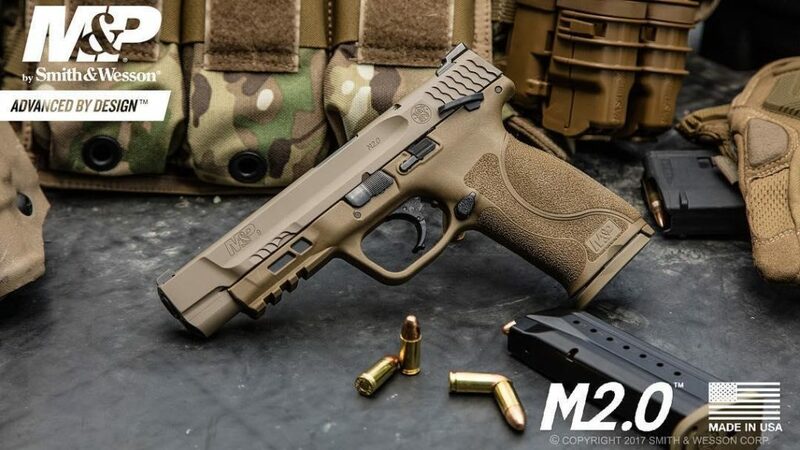 Do you own one of the M&P models? What are your thoughts on it? Let us know in the comments below.